A man has reacted with surprise to seeing his photograph used in a fake story spread on social media that an Imam kept a mosque's doors closed to Storm Harvey victims. 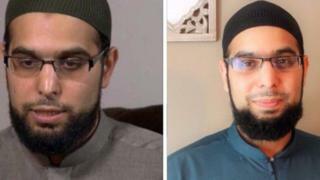 Ibrahim Hindy, a Canadian Imam from Toronto, identified himself in the photograph used in a story which claimed Imam "Aswat Turads" of "Ramashan mosque" near Houston refused to help flood victims and said "we are forbidden from helping infidels." Storm Harvey brought devastating floods and displaced thousands of people while many centres or volunteers offered shelter and assistance to victims. However, Mr Hindy claims he has never been to Texas and during the flooding he was in Mecca, Saudi Arabia, performing the Hajj pilgrimage. The story was published on 31 August on the website America's Last Line of Defense, which calls itself satirical. "[This] is a satirical publication that may sometimes appear to be telling the truth. We assure you that's not the case," it explains. It stated Ramashan mosque could have sheltered over 500 people but would not accept any non-Muslim people on the order of the Imam. Another story claimed flood refugees later stormed the mosque to find shelter. A picture of Ibrahim Hindy was used underneath the headline "Texas Mosque Refuses To Help Refugees: 'Allah Forbids Helping Infidels'". It appears to have been taken seriously by thousands of people and the site's story was shared more than 126,000 times. On Monday morning, the site changed Mr Hindy's image to a picture of Lebanese Imam Ahmad al-Assir. The story was also published on Daily Post Feed, which also claims to be satirical. The site's stories usually take aim at Democrats and liberals, but, again, a similarly-worded disclaimer explains "all images should be considered altered and do not in any way depict reality". A photograph of Californian Imam Ammar Shain was used in their version of the story of Ramashan mosque. Fake news: What's the best way to tame the beast? A prominent Twitter account tweeted the story with hastags #DrainTheSwamp and #MAGA ('Make America Great Again') - campaign slogans of US President Donald Trump - as well as #TrumpTrain, also used by right-wing accounts. @JimRobinson3rd's tweet was retweeted 1,800 times and liked nearly a thousand times. Some users responded with Islamaphobic comments while others pointed out the story was fake. While the story was debunked the day it came out, it wasn't until Saturday Mr Hindy tweeted it was his photo being used. His tweet has since been shared more than 200,000 times and liked almost 350,000 times. "I woke up and checked my phone [... a] website made up a story about a Texas mosque refusing to help non-Muslim Hurricane Harvey victims and used my picture for their made-up story," he commented on Facebook. Some have pointed out the names for the mosque and the make-belief Imam are clearly false as they do not resemble actual Muslim names. Nor can the 'Ramashan' mosque be found on search engines or maps. However, people continue to post the story. Yesterday it was retweeted more than 4,000 times, and liked almost 3,000 times, from a Twitter account with the handle @AMike4761. "My friends and I have been praying for the #HurricaneHarvey victims our entire time here. I met one man from Houston in our hotel who told me that he lost his entire house while away for Hajj. The hardship they have endured has been devastating." Muslims living in the Houston area pointed out local mosques had sheltered people made homeless by Harvey. At least four mosques are believed to have been turned into 24-hour shelters providing food and water.